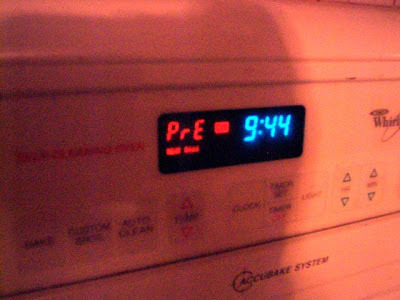 STEP ONE: Preheat the oven to 325 degrees. STEP TWO: Spray an 8x8" metal pan with non-stick cooking spray. 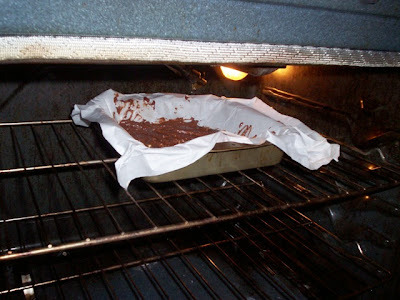 Mom told me that Martha Stewart suggests that, when making brownies, you should pour the mix onto parchment paper rather than directly into the pan. That way you won't have to spend the rest of the day trying to scrape the brownies off of the bottom. Good idea! 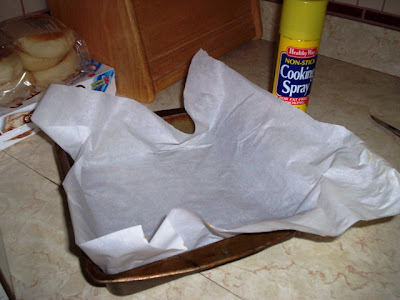 Instead of spraying the pan, spray the paper. Oh, and yes, the paper is a huge pain in the a**. 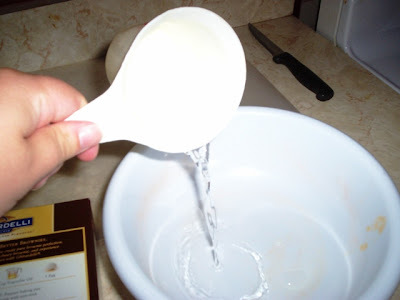 STEP THREE: Pour 1/4 cup of water into a mixing bowl, which may or may not contain irreversable spaghetti sauce damage. 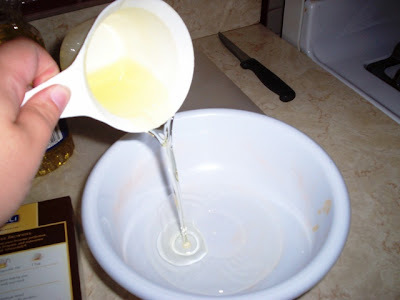 STEP FOUR: Pour 1/4 cup of vegetable oil into the bowl. 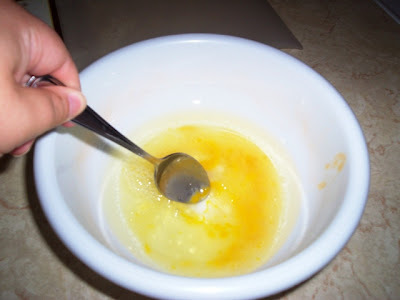 STEP FIVE: Crack an egg and put it into the bowl. 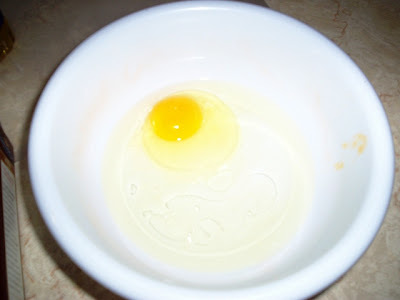 STEP SIX: Blend the egg, water, and oil until they are ... well ... blended. 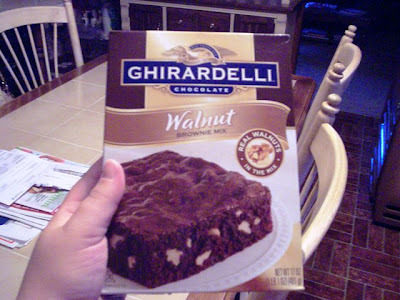 STEP SEVEN: Pour in the Ghirardelli Walnut Brownie Mix. 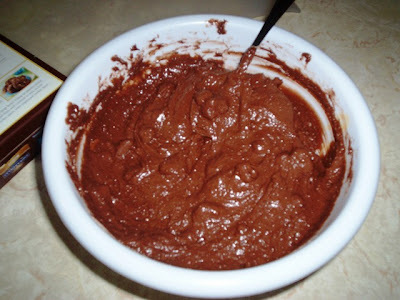 STEP EIGHT: Stir until mix is fully moistened. STEP NINE: Spoon batter into the pan, or in this case, into the center of that crazy parchment paper. STEP TEN: Put the pan into the oven. 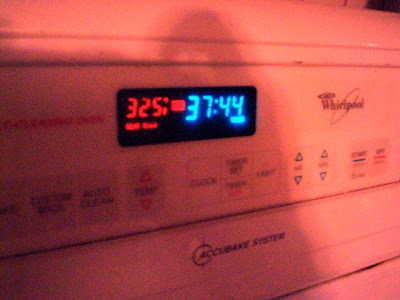 STEP ELEVEN: Set cook time between 38-42 minutes. I chose 38 to start. 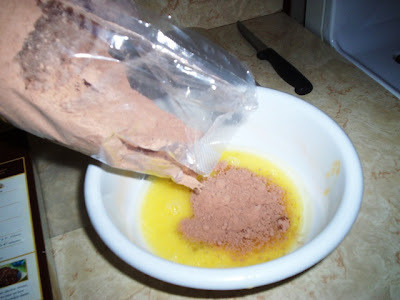 STEP TWELVE: After the time has ended, check your brownies. I had to leave them in an extra two minutes because they weren't fully cooked. To check to see if they are ready, put a knife into the brownies. If the knife comes out clean, they're done. If the knife has liquid on it, leave them in a few more minutes. STEP THIRTEEN: Take the ends of the parchment paper and pull it gently away from the pan. 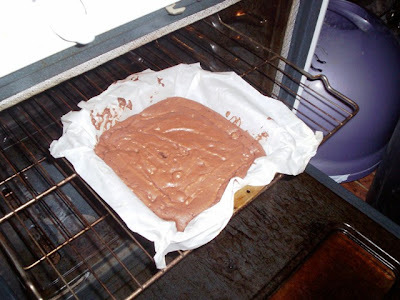 Put the brownies (still in the paper) on the counter/table to cool down. Because they're out of the pan, they'll cool faster (which is awesome because at this point I was dying for one). STEP FOURTEEN: Cut and serve. The box said that I should have been able to get 16 brownies out of this mix, but I wanted nine big ones instead. You can do whatever you want. I just didn't want to be bothered having to get up to grab a second (or third) brownie. THE VERDICT: Divine! 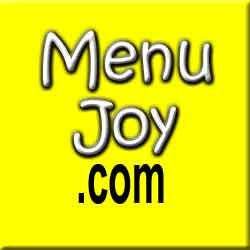 Remember that Fig Newton jingle that went something like, "Ooey gooey, soft and chewy inside ... soft and cakey, tender flaky outside ..." Those aren't the right lyrics, but they get the point across. 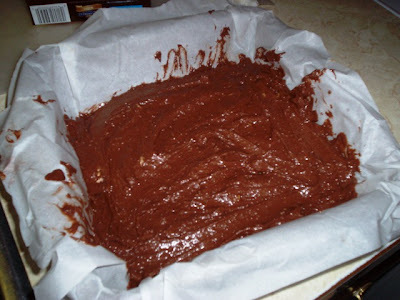 The brownies were fudgy without being too thick, and they had a cake texture without being too soft. Perfect! I adored the walnuts inside. It was such a nice change from years of forcing myself to eat nutless brownies (somehow I muddled through). I would definitely buy (or make Mom buy) this mix again, and I would HIGHLY recommend using the parchment paper. 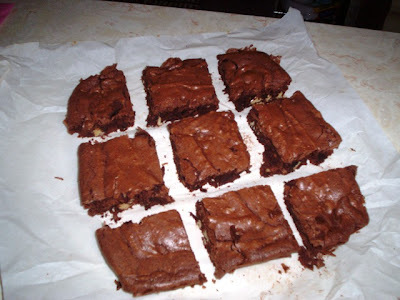 It was a pain to put in the pan, but it was well worth using it because I didn't have to struggle with removing the brownies. 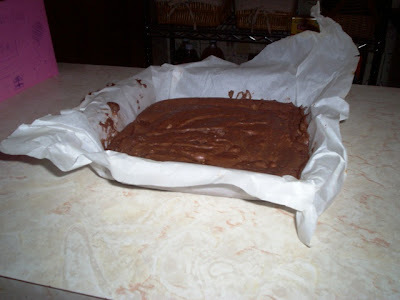 Plus, the brownies actually stayed in one piece! Thanks for the suggestion, Mom ... and Martha!